Epic Media design & print is owned and operated by Jake and Tara Bridge since 2007. 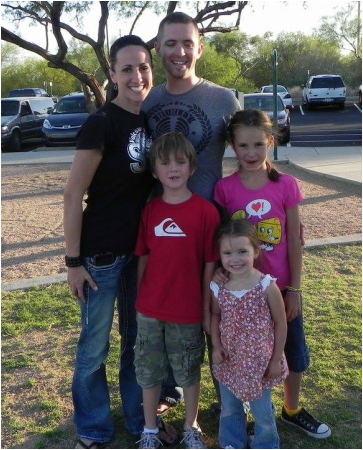 They were married in 1998 and have 3 beautiful children who do their part to help with the work load to earn extra cash. Jake began learning many aspects of graphic design, screen printing and offset printing through a vocational work program during high school and soon after graduation began working for the next 10 years at a local Gilbert print shop as graphic designer and bindery technician for the first few years before graduating to senior printing press operator of a Gilbert shop as well as a Tempe print shop. Between the two print shops daily operated several offset printing presses from older model Multi 1250 & 1650's, Toko R2SH Twin Tower and Full Color Direct to Plate Ryobi as well as several brands of digital duplicators and digital presses. Epic Media has been printing commercially for over 16 years. We offer high-quality digital printing, traditional offset printing, as well as large format printing. LOGO DESIGN - BUSINESS CARDS - POSTCARDS - FLYERS - BROCHURE - LETTERHEAD - ENVELOPES - FORMS - STICKERS - BANNERS - SIGNS - VEHICLE WRAPS - MAGNETS - T-SHIRT SCREEN PRINTING - EMBROIDERY - GRAPHIC DESIGN - AND MUCH MUCH MORE! !